Is It Time to Buy Stock in Exelon? Shares of top nuclear power generator Exelon have fallen about 10% over the past 12 months. However, performance had been much worse as the stock bottomed out last November, amid falling natural gas prices and a rumored dividend cut. Since the fallout, Exelon shares have risen nearly 20% as investors have adjusted to the reality of the new dividend rate. The stock has also been helped by a steady rise in the price of natural gas. While the correlation isn't perfect, there is a noticeable link with both recently trending higher. You see, Exelon's business might be powered by nuclear, but power prices are being fueled by the shift toward natural gas. 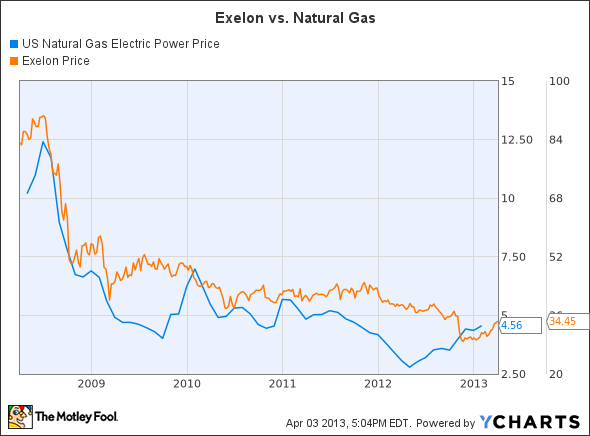 As such, Exelon's stock prices seems to move along with the price of natural gas. Given falling rig counts, production declines, and increased demand, natural gas prices have the potential to head even higher. However, growth driven by commodity price isn't true growth. What would make Exelon's stock a long-term buy is if the company had a plan to grow its earnings outside of the noise of commodity volatility. Its industry peers seem to have a much more visible growth plan. Take Dominion for example. The company is executing on a growth plan to grow its earnings by 5%-6% annually through 2017. To get there the company will spend about $3 billion per year on a variety of projects specifically designed to add to earnings. It's a similar story at NextEra Energy . The company has a four-year plan to spend upwards of $23 billion geared to grow its earnings. As it does, the company believes it can grow earnings by 5%-7% per year through 2016. Both Dominion and NextEra expect that this earnings growth will drive dividend growth, something Exelon investors will likely not hear about for quite some time. Therein lies the problem, without visible earnings and dividend growth, it's tough to be overly excited to buy Exelon's stock. It's really tough to grow when the company isn't spending a whole lot of its capital on growth projects. While Exelon will be spending $575 million to grow its solar business this year, it's only planning to spend about $100 million in each of the next two years. Further, there's virtually no spending to grow its wind generation which has been a key driver for NextEra's business. It is possible that the company will decide to buy rather than build. Just the other day BPput its wind assets on the market. The company is seeking $3.1 billion for its 2,600 megawatts of current and yet-to-be-built, wind-generating capacity. Those assets would really boost the company's wind capacity. There is some precedence here as Exelon snapped up Deere's wind business a couple of years ago. In the deal, Exelon picked up 735 megawatts of wind generation with another 1,400 megawatts of generating capacity in development. The company paid about $900 million in a deal that made sense for both companies as Deere wanted to exit the power business while Exelon wanted to jump-start its wind operations. Until we get some more clarity on exactly how Exelon intends to grow earnings, it's not the best utility stock to buy in my opinion. Part of the reason why Exelon cut its dividend was to preserve its investment grade balance sheet in order to pursue growth projects. Right now that is nothing more than an idea. That's why I prefer the visible growth offered by both Dominion and NextEra. That being said, the potential is there for Exelon as the nation moves increasingly toward clean energy. Exelon is perfectly positioned to capitalize on this future as it has the largest nuclear fleet in North America. This strength, combined with an increased focus on balance sheet health and its recent merger with Constellation, places Exelon and its resized dividend on a short list of the top utilities. To determine if Exelon is a good long-term fit for your portfolio, you're invited to check out The Motley Fool's premium research report on the company. Simply click here now for instant access. The article Is It Time to Buy Stock in Exelon? originally appeared on Fool.com. Fool contributor Matt DiLallo is short Apr 2013 $35 puts on Exelon. The Motley Fool recommends Dominion Resources and Exelon. Try any of our Foolish newsletter services free for 30 days. We Fools may not all hold the same opinions, but we all believe that considering a diverse range of insights makes us better investors. The Motley Fool has a disclosure policy.